It would be unwise to deny that our world has gone digital. Even elementary school students have smartphones, smartwatches, and tablets. But many people in the teaching community are still opposed to using these devices in classrooms. They are often viewed as expensive toys that distract the children. But this prejudice rather hinders the process of learning in modern times. Children encounter devices everywhere they go, and it is only right to broaden their horizons through teaching them technology. 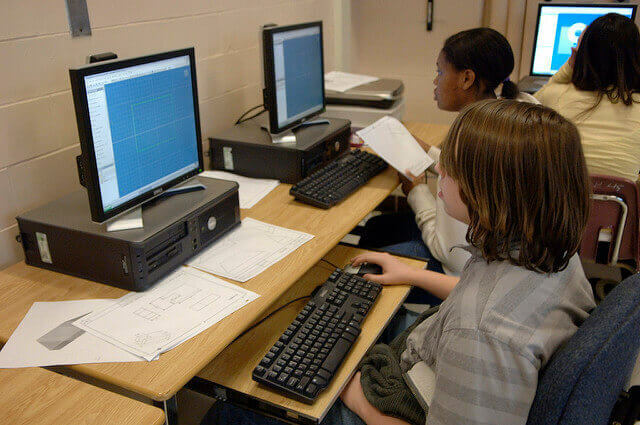 Many college and high school students routinely use computers and other technology for their assignments. But the potential of the technology is not being used fully. Moreover, digital learning of any kind is virtually absent in middle school and elementary school. On the other hand, research shows that interactive assignments are beneficial even for younger grades. There are many ways in which students may use technology to help them with their goals. Let’s find out how! 1. Developing search and analyzing skills. Powerful search systems allow finding anything from a resume writing service to information on rare historical documents. But many teachers view Internet searches as a source for cheating. In their mind, students just go to Wikipedia and copy-paste from there. But there is another approach. In fact, an online search can be used for educational goals. Wiki can be a good first step if one needs to get a brief overview of a subject. But, of course, other sources are to be used as well. Still, targeted and organized searches help students learn important skills, such as composing search queries, analyzing information and citing sources. Plus, it can be used for fast and efficient fact-checking. 2. Learning to present their findings. Gone are the days when students painstakingly drew pictures and glued them on a big canvas sheet to bring it to school. Now presentations can be made digitally with the help of online presentation tools. One can add videos, animations and pretty images quite easily. Even without particular designer skills, even young children can make small presentations about animals, weather and whatnot. Applications such as PowerPoint allow showcasing the tasks easily. The files also can be easily uploaded to a common platform. And they take up much less space! Many students are too shy to openly speak or ask questions in class. Using online forums and discussion boards, you may empower them and give them a safe place to express their thoughts. Assignments, essays, and ideas can be discussed on the online platforms allowing feedback not only from the teachers but other students as well. Social learning has many proven benefits, after all. 4. Reaching out to homeschoolers. Online courses and distant learning provide a great opportunity for those who do not thrive in traditional classrooms. While homeschooling sometimes feels isolating, courses that combine interesting media assignments, social learning, and variety of lessons help such students not only to acquire knowledge but to connect and engage with the peers as well. Modern technologies, such as virtual reality and 3D animation, can bring almost anything alive. With new applications, children can witness prancing dinosaurs, dive into the deep ocean and see the Pyramids of Giza in all their glory. To bring these tech wonders, one would only need a good Internet connection and a quality computer to bring these unforgettable experiences to your pupils. Of course, to make the most of the technology available, the schools need to have minimal requirements, such as a stable Wi-Fi, credible Internet service provider, and computers. Nevertheless, getting the equipment, and dwelling on the advantages it brings if used properly, will certainly be worth the effort.